A new offender is invading Appalachia Ohio. The offender’s painfully sharp prickles are known to cut into human and animal skin, earning it a nickname of “tearthumb”. Its aggressive growth of up to 6 inches a day should be a concern to any landowner in the area. 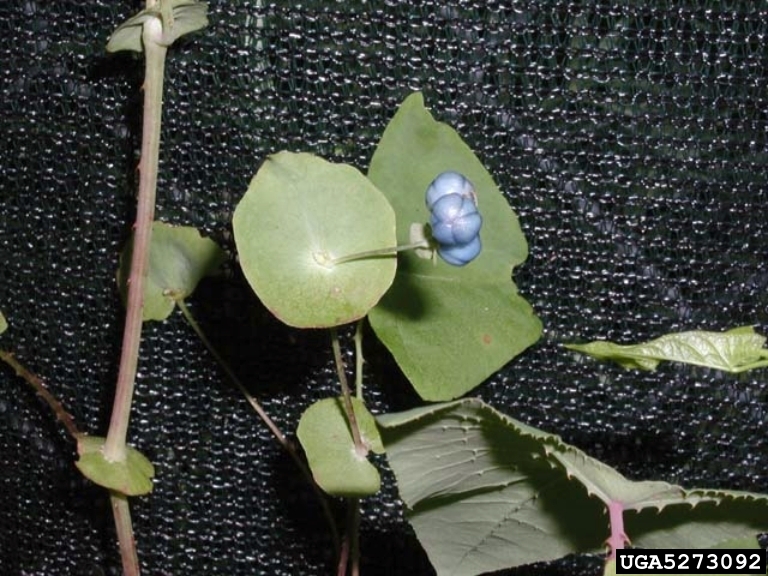 The culprit: mile-a-minute vine (Polygonum perfoliatum). Native to Eastern Asia, mile-a-minute vine was first introduced to Pennsylvania in the late 1930’s, contaminating a shipment of rhododendrons. Despite control efforts, mile-a-minute vine has become established in Pennsylvania, Maryland, and West Virginia and now is expanding across the Ohio River into Ohio and is has currently been found in both Washington and Lawrence Counties. Growth of mile-a-minute vine is rapid and can easily crowd out native flowers, shrubs, and tree saplings or seedlings. This aggressive growth can prevent forest regeneration after timber harvest, interrupt Christmas tree farming, and has a potential to become a pest in plant nurseries and agricultural production. Spines along the stem and leaves can make a recreational walk through the forest painful and unpleasant. With the abundance of multiflora roses, briars, and brambles in Appalachia Ohio, the last thing the area needs is another plant covered with spines. If mile-a-minute vine is left alone and continues to spread and multiply it will hurt the economy of our region by impacting the timber industry, agricultural production, and recreation. Mile-a-minute vine aggressively invades fields, roadsides, right-of-ways, forest edges, open woodlands, stream banks, and moist meadows. Birds are the principal long distance carriers of seeds, although it has been found to be dispersed by ants, deer, chipmunks, and squirrels. Mile-a-minute fruit is able to maintain buoyancy for up to 7-9 days which allows long-distance travel downstream. The best characteristics for identifying mile-a-minute vine are its distinctive equilateral triangular shaped leaves and downward facing spines covering the underside of leaves and stems. These spines will stick to clothing and tear at skin. The leaves are approximately 1-3 inches wide, green, waxy, and arranged alternately up the stem. Spaced along and surrounding the stems are cup shaped structures called ocreas. From these ocreas, small white flowers bloom that eventually develop into small, metallic blue fruits about the size of a pea. To report sightings of mile-a-minute vine outside of Washington County, contact Eric Boyda at 740-534-6578 or appalachianohioweeds@gmail.com. More information about the control of mile-a-minute can be found here. Posted on January 28, 2013, in Species profiles. Bookmark the permalink. 3 Comments. I have been fighting the mile a minute weed in Newport township, section 28, washington county, ohio for the past 5 years. This for your info. Do you have any specific control techniques you have been trying? or herbicides?